Lame looks normal if you see it often enough. Lame is not normal. Confusion exists over when a horse is lame. For example, horses are described as sore, uneven, better in one direction than the other, lugging, pulling, running off, or having other behaviours associated with pain that are confused with education and training. Do not confuse the issue by using other words to describe the problem. If you are sore, what you are feeling is pain. When you are stiff you have restricted motion due to pain. Lame = pain and pain = lame, sore, stiff, uncomfortable etc. The only exceptions to this rule are functional lamenesses which are not caused by pain, but do result in an abnormal gait. The single most effective way to stop a horse from “wanting to try” is pain. A horse won’t do something when it hurts, and cannot try harder or do something new or more difficult if it hurts. It is not mind over matter, you know yourself that it is physically impossible, because pain is there to prevent us from doing even more damage to ourselves. Pain is a protective response, and it prevents us from using that part of the body normally. When you push a horse that has pain you are effectively teaching the horse not to do the thing you want it to. “Make the right thing easy and the wrong thing difficult”, not the other way around. Any degree of pain that results in a visible lameness or a lameness that is felt when the horse is ridden is of concern, and should be investigated, treated and if the lameness is of a chronic nature e.g., osteoarthritis, it must be treated and managed for the long-term welfare of the horse. We often forget that it only matters to us if we don’t go to a show, event, rodeo, pony club rally, endurance ride etc. It does not matter to your horse. Your horse does not share your goals and expectations. It enjoys many activities with you including competition, but it has no plan for the future, your horse lives only for today. Your horse also has no concept of its own life expectancy; which will be dramatically shorter if it is chronically lame. Your horse does have needs and these include food, water, shelter, equine companionship and freedom from cruelty. Failure to recognise and treat lameness is common. Most people, once a problem is pointed out, will take steps to treat the problem. Pushing a horse into further work which makes the lameness worse is unkind. For example, the race horse that is raced beyond it’s best and is retired chronically unsound. If it is lucky it may be a loved paddock pet. If it is unlucky it will wind up neglected or as pet food because it cannot be rehomed. I regularly meet people with the best of intentions who have built up a wall of defences regarding the lame horse that they own. I recognise this because I have done it myself, (refer to story below). We become used to the lameness, hardly see it as a problem in its own right anymore, and accept all sorts of abnormalities. When questioned, there is often a long history and some form of a diagnosis has been reached. The problem is often only being discussed because of another secondary problem the horse has developed, such as back pain, behavioural problems, other forms of ill health e.g., ulcers, or problems associated with poor performance. Common sense would make us realise that by treating the primary lameness problem we will be effecting all of the secondary problems as well. However, common sense has often been dulled by daily exposure, a long history and the drawn out process which led to the current situation. A significant impediment to improvement is that owners often believe they have already tried everything including farriery, medication and alternative therapies. They will say “we have a great farrier” and he/she does a good job. This may be true, but you cannot be sure unless you know what good farriery should look like and you have checked the work. There is a big difference between good farriery and better farriery! Sadly, few horse owners can recognise good farriery at the current time, and if they don’t know what can be acheived with better farriery, they don’t realise how much more may still be achieved for their horse. Farriery, nutrition and management achieve better results together than any one factor alone. My main aim for the information presented at the farriervet web site is to change this lack of knowledge and to empower owners to take control of the standard of farriery their horse receives. This information will initially be available as a DVD, and later as a book. My motto is “good farriery is good, better farriery is better“. A better standard of farriery makes a most significant difference in the long-term management of horses. An improvement in your horse’s quality of life will also impact in a positive way for the owner’s quality of life. Therefore, before reading further and putting up defenses and thinking this does not apply to you, please, clear the slate and read and research with an open mind. This is an opportunity to seek out long-term answers to your horse’s problems. Remembering that one of your horses biggest problems is you, your beliefs, your attitudes, your goals, your standards, your finances and your expectations. All the very best, Judith. I have a lovely, big, brave Thoroughbred gelding who came to me many years ago in a special way. I walked into the paddock to look at a racehorse to train, and this enormous horse “with a very good eye and tough head” came over, put his face into my chest, and said into my mind “take me home”. We have been together ever since, and I have promised to feed and care for him for life. I cannot explain the connection. This horse has taught me many things, and we shared a few special achievements. 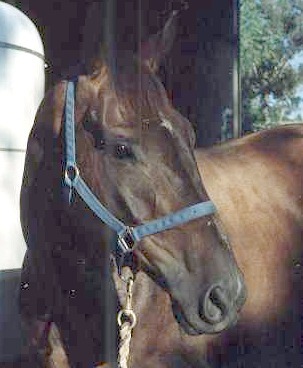 Initially Bob had many foot problems, and was one of the first horses in Australia to trial the Mustad glue-on shoes. When we could shoe him normally we still had problems with hoof-wall quality, as he was in poor condition when we got him. There was always a subtle something nagging at me. I would notice he was lame, give him time off, and when he improved, put him back into training. His fastest gallop was slow, but he could go a long way at that speed. I rode and worked him very hard as he needed to be fitter than the competition. I can honestly say that despite the theory that they all slow down when they are tired, I could never ride this horse long enough or hard enough to get him to give up. He had enormous stamina, and the fitter he got, the further he went before he was even remotely tired. I always ran out of energy first. I would often “ride one lead one”, and one day I clearly noticed a few head bobs as I was leading him off another horse. I had often thought I sensed a slight hesitancy when I first warmed him up, but this day it was clear. It was only for a few strides, but it was there. I kept working and racing him beyond this time, and he eventually bowed a tendon for the second time and was retired. He gave other clues to his underlying problem. When he was shod he was always a bit difficult on the off-fore (right front), and did not like it being flexed. I put this down to a behaviour problem. One day when I walked up to him and picked up that leg first he pulled back and flipped straight over. My horse was on the ground. I was shocked, but I still didn’t see the problem. After Bob was retired from racing I wanted to do other things with him and I made every excuse for his slight lameness. He isn’t shod, he has arthritis in the near-fore (left front), or so I thought, his tendon is still healing, it is temporary, he will get better. He didn’t get better. I wanted to get back in the saddle, Bob Horse was dynamite to ride and I missed him. As a young horse, I saw and felt his lameness but I was missing the subtle clues he was giving me. I was looking at the wrong leg in the wrong place for over 4 years while he was in work, and even years later it took a long time without seeing him daily for my eyes and mind to recognise the reality. I had made up my mind years ago what and where the problem was, and now I know that I was wrong. Bob is now nearly 20 years old and I can see the big, arthritic right knee which was smouldering away when he was a young race horse. He is chronically lame in that leg. He can walk, trot and canter about, and it is not severe enough to warrant euthanasia; he lives a very good life, but, the other day when I trimmed his feet I flexed that knee a few inches too high and he gave a grunt and began to pull it away. I then lowered the leg immediately, he relaxed and we finished the trim without any problem. He is very forgiving of my mistake as a farrier. I should remember his physical limits. Bob Horse lives in a big paddock near to home and gets a special diet to help his arthritis. He lives with his little mate Howard Pony who was rescued by my Mum, but that’s another story! !